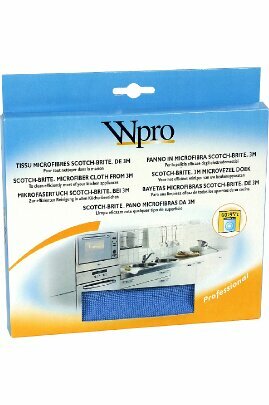 Do you need a microfibre cloth too? Follow this link. With all the water and energy savings that high efficiency washers provide, they still require special care. After normal use, mold, mildew and odour-causing residue may form in hard to reach areas of your washer. 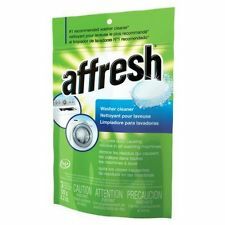 Affresh washer cleaner is specially formulated to remove the odour and clean the stains left behind by mold and mildew. The powerful, oxygenated action of Affresh washer cleaner penetrates, dissolves and reduces or removes odour causing residue and sends it flowing down the drain. In the time it takes to run one normal or 'clean washer' cycle with hot water (without clothes), your washer will be residue and odour free again. To keep your washer clean and fresh, use one Affresh tablet once a month. When a strong odour is present, run three consecutive washes (without clothes), using one Affresh tablet in each cycle. While bleach can kill the bacteria that cause odourous residue, it is not as effective at removing the residue itself. Only Affresh washer cleaner is proven to penetrate, dissolve and reduce or remove the residue that causes the odour. Pack Contains: 3 x Power Puck tablets. You wouldn't want to wash up in a dirty sink, so why not keep your dishwasher sparkling clean as well? 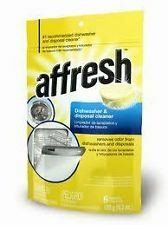 The Affresh Dishwasher & Waste Disposal cleaner is the powerful, ground-breaking solution for unwanted dishwasher odour. These innovative tablets help prevent odour in the dishwasher and waste disposal. Developed for easy use, these cleaner tablets help remove even the most stubborn odours from dishwasher and waste disposals. Its innovative fibre combination lifts and traps dirt, dust particles and grease and cleans without scratching most types of surface, including stainless steel, with or without detergent. It can be used dry or slightly damp and it is bleach resistant, even non diluted. 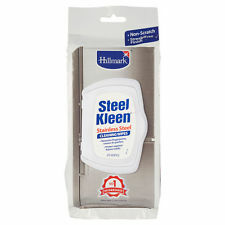 Need a stainless steel cleaner? - follow this link. 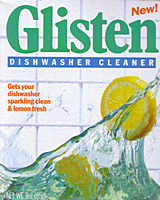 Gets your dishwasher sparkling clean and lemon fresh. 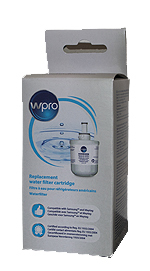 - Helps to remove soap scum, food stains and discolouration from water impurities. - Excellent for plastic, stainless steel and procelain tub dishwashers. - For best results use monthly. - Contains natural food acids.